Canonet QL19E is a 35mm film rangefinder camera manufactured by Canon and produced between 1965-69. It belongs to the long lasting Canon Canonet series which produced between 1961-82. 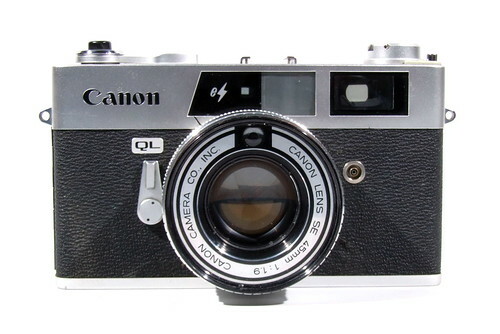 Canonet QL19 E is the first Canon camera that have an electronic shutter. The shutter blades were controlled by magnet. The QL19 E has no manual controls and like wise little information about exposure.The “E” version was made with a Sieko EE shutter vs. the standard Copal SV shutter on the rest of the QL line. Canonet QL range was introduced by 1965, as a development of the Canonet, with shutter priority CdS-meter controlled auto exposure and manual override. Their difference in name corresponds to those of their apertures. The QL17 had a 45mm f1.7 lens, the QL19 an f1.9, and the QL25 an f2.5, set in Copal SV shutters. See also the article Canon Canonet QL 17 / QL 19 / QL 25.